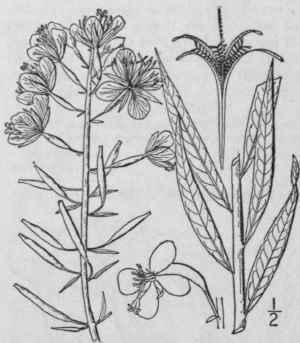 This section is from the book "An Illustrated Flora Of The Northern United States, Canada And The British Possessions Vol2", by Nathaniel Lord Britton, Addison Brown. Also available from Amazon: An Illustrated Flora of the Northern United States, Canada and the British Possessions. 3 Volume Set..
About 4 species, chiefly in the north temperate zone. Type species: Epilobium angustifolinm L. Bracts small; lateral nerves of the leaves confluent in marginal loops; style pubescent at the base. Bracts leaf-like; lateral nerves of the leaves obsolete; style glabrous. Epilobium angustifolium L. Sp. Pl. 347. 1753. 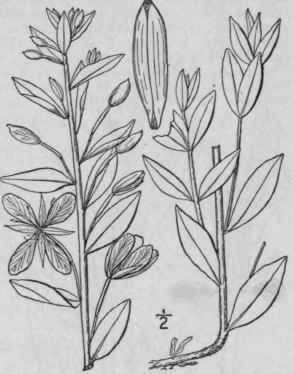 C. angustifolium Scop. Fl. Cam. Ed. 2, 1: 271. 1772. Epilobium spicatum Lam. Fl. Fr. 3: 482. 1778. Erect, rather stout, simple or branched, glabrous or often finely pubescent above, 2°-8° high. Leaves alternate, very short-petioled, lanceolate, entire or denticulate, 2'-6' long, 4"-12" wide, pale beneath, acute at the apex, narrowed at the base, thin, the lateral veins confluent in marginal loops; flowers 8"-15" broad, purple, or sometimes white, in elongated terminal spike-like racemes; bracts mostly shorter than the pedicels; petals entire; style pubescent at the base; stigma 4-lobed; capsules 2'-3' long, about 1 1/2" thick, finely canescent, at least when young; seeds about i" long, smooth, or nearly so, the coma long, whitish. In dry soil, Greenland to Alaska, North Carolina, Indiana, Kansas; the Rocky Mountains to Arizona; Pacific Coast to California. Europe and Asia. Often abundant after forest fires. French-, bay- or Persian-willow. Rose-bay. Fire-top. Burnt weed. Purple rocket. French or bay willow-herb. Indian wickup. Herb-wickopy. Flowering or blooming willow. Pigweed. Blooming sally (i. e., Salix). Sally-bloom. June-Sept.
Epilobium latifolium L. Sp. Pl. 347. 1753. C. latifolium Sweet, Hort. Brit. Ed. 2, 198. 1830. Erect, usually branching, glabrate below, often quite canescent above, 6-18' high. Leaves mostly sessile, 1'-2' long, 2"-6" wide, denticulate or entire, lanceolate or ovate-lanceolate, acutish at both ends, thick, those of the branches opposite, the veins inconspicuous; flowers purple, V-2' broad, in mainly short leafy-bracted racemes; petals entire; styles glabrous; stigma 4-lobed; capsules 1'-1 1/2' long, about 1 1/2' thick, canescent; seeds about 1" long, nearly smooth; coma elongated, whitish. Moist ground, Newfoundland to Alaska, south to Quebec, Colorado and Oregon. Also in Europe and Asia. June-Aug.